ULM. "Ansicht von Ulm". Gesamtansicht die Donau entlang, auf dem Fluß Ulmer Schachtel und Boot. - Aquatinta von R. Bodmer nach H. Neukom bei Locher, Zürich, um 1835, 17 x 25 cm. Nebehay-Wagner 371, 12; Schefold 9815. - Aus der seltenen Folge "Malerische Reise der Donau" von J.H. Locher, um 1830. - Breitrandig. DONAUESCHINGEN. "Ansicht der Stadt Donaueschingen, Residenz des Fürsten von Fürstenberg ect.". Gesamtansicht von der Höhe im Westen gegen den Wartenberg, im Vordergrund Fuhrwerk. - Aquatinta von J. Ruff nach H. Neukom bei Locher, Zürich, um 1835, 16,5 x 24,5 cm. Nebehay-Wagner 371, 1; Schefold 22174 und S. 814. - Aus der seltenen Folge "Malerische Reise der Donau" von J.H. Locher, um 1835. - Breitrandig. [N.p., 1835. Mounted at the upper and lower edges to a slightly larger sheet. Fine. 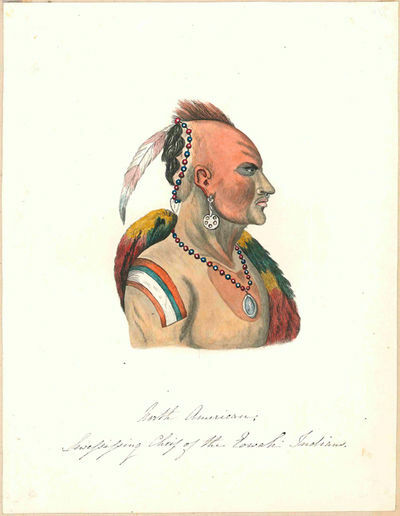 A handsome watercolor of a Native American chief, after the original by Charles Hamilton Smith that appeared as a colored engraving in Baron Georges Cuvier's THE ANIMAL KINGDOM. This illustration is unsigned, and depicts the Sewessissing, chief of the Iowa Indians. The unknown copyist of Smith's original displays himself as an artist of some talent, having produced a remarkably accurate version of the original. The profile is strong and sharp, and the colors are lively and the shading sensitive. It is a highly accomplished portrait of a striking Native American warrior. This illustration of "Sewessissing Chief of the Eowah Indians," appears in the first volume of Baron Cuvier's sixteen-volume work, THE ANIMAL KINGDOM, which was published in London from 1827-1835. The first four volumes of that work are dedicated to the the "class mammalia," and contain hundreds of illustrations, mostly of animals. Of these illustrations, some eighty-three are by Charles Hamilton Smith, including this portrait of Sewessissing, and a portrait of a young African male. The portrait of Sewessissing is included in order to illustrate what Cuvier proposed as a new variety of the human species, the "American," who Cuvier saw as "a link between the Caucasian and the Mongolian, but approximating more to the latter." The text goes on to describe the (native) American thusly: "the skin is dark, with more or less of a copper tint. The hair is straight and black, the beard small, forehead low, eyes dark and oblique, face broad and prominent, and cheeks rounded. The features, in general, particularly the nose, are more distinct and projecting than in the Mongolian type. The mouth is large, and the lips are rather thick." Smith's portrait of Sewessissing is an excellent illustration of Cuvier's "North American." Charles Hamilton Smith (1776-1859), a soldier, artist, and natural historian, was born in East Flanders and studied at the Austrian Academy for Artillery and Engineers, after which he embarked on a career in the British army. Smith saw duty in the Napoleonic wars, and in 1816 was sent on a mission to the United States and Canada. It is likely at this time that he observed Native Americans, and his resulting illustration of Sewessissing was almost certainly done from his firsthand observations. Following his retirement in 1820 Smith devoted himself to his art and natural history studies, producing thousands of watercolors, and lecturing and publishing widely. Smith worked closely with Cuvier on natural history publications, and was elected a Fellow of the Royal Society in 1824. "His industry enabled him to master several disciplines and his accuracy of observation assisted him in the making of accurate drawings of his subjects" - DNB (online). Aussicht vom Stindtfang nach Osten über Hamburg. Altkolorierte Kreidelithographie im Verlag von Levin Stettenheim um 1835. Souvenirs de la Suisse. 100 vues les plus remarquables. Genève, chez Briquet et Dubois, Rue du Rhône, vis-à-vis de la Poste aux Lettres, s.d. (vers 1835-40), - in-8vo oblong, 17x13 cm. gardes roses imprimées de publicité pour l'éditeur à gauche et le titre à droite + 100 vues lithographiques par Lemercier, Kaeppelin, Engelmann père et fils, de Bernard et Frey à Paris et Pegeron fait par plusieurs dessinateurs d'après Dubois, qqs planches un peu déreliées, qqs taches éparses, reliure originale en cuir, titre et ornements imprimés or et à froid. (reliure romantique d'époque). Tranches dorées. Très bel exemplaire. Rare de trouver l'ouvrage complet au lieu des planches séparées, après les années de folie de l'encadrement. C'est exceptionel de trouver l'album complet et dans sa reliure d'époque. Le souvenir touristique par excellence des années fastes de l'alpinisme et voyages en Suisse. Il va sans dire que le grand- et le petit-tour (du tourisme) passait par le Mont-Blanc, Chamonix, Mer de Glace et le Grand Saint-Bernard et que ses vues ont presque toujours été inclues dans les albums touristiques sur la Suisse. L'Album des 100 vues est une compilation de plusieus recueils. Les planches ont été redessinées par Drulin, Sorrieu, Petitville, Rothmuller, Frey, Cuvillier e.a. d'après DuBois. Lithogr. de: Winkelried- Grutli- Bâle- Baden- Schisnach- Chute du Rhin- Ile de Meinau- Glaris- Appenzell- Pfeffers- Coire- Reichenau - Rhin inférieur- Via Mala- Chûte de Pianazzo- Splugen- Domaso- Villa Pliniana- Specco- Villa Canzi et Torno- Zurich- Rapperschveil- Lac de Lowertz et Goldau- Notre Dame des Hermites- Arth- Chapelle de Tell- Mont Righi- Monte Pilate- Lucerne- Lucerne- Monument à Lucerne- Sommité du Rigi- Chapelle de Tell- Notre-Dame des Neiges- Trou d'Uri- Pont du Diable- Hospice du St. Gotthard- Hospital St. Gotthard- Chalet à Unterwald- Maison à Lucerne- Hospice du Grimsel- Oberhasli- Ferme Bernoise- Maison Bernoise- Cascades à Meiringen- Wellhorn & Wetterhorn- Reichenbach- Jungfrau- Grindelwald- Jungfrau- Brientz- Thun- Alpes Bernoises- Staubach- Thun- Berne- Chute de l'Aar- Giesbach- Hermitage de Ste Verène- Nidan- Habitation de Rousseau- Pierre-Pertuis- Neuchâtel- Fribourg- Fribourg- Morat- Vevey- Ouchi- Lausanne- Chillon- Lausanne- Nion- Coppet- Ouchi- Genève- Ile de Rousseau- Genève- Genève- Chamonix- Flégère- Mer de Glace- Mont-Blanc- Glacier de Chamonix- Martigny- Martigny- St. Maurice- Bex- Pissevache- Hospice de St. Bernard- Eglise de l'hospice de St-Bernard- Salon à l'hospice de St-Bernard- Hospice de St-Bernard- Simplon- Galerie du Simplon- Iles Borromées- Isola Bella- Statue de Charles Borromée- Bellinzone- Sesto Calende- Lugano.Please notify before visiting to see a book. Prices are excl. VAT/TVA (only Switzerland) & postage. cf. Perret 1182. TA., Dom, "Il Duomo di Milano. - Cathedrale de Milan". - Aquatinta n. u. v. Rupp, um 1835, 33 x 45 Seltene großformatige Ansicht mit schöner Personenstaffage. Journal of a Tour through some of the vineyards of Spain & France. New York: Charles S. Francis, 1835. Octavo, 166 pp., 2 pp. terminal advertisement for the New York printer; bookplate of Australian wine-maker Max Lake, bound in recent brown cloth. Printed in New York for the fledgling wine-making industry in America. The London edition of this important book is seemingly the rarest of any of the three revolutionary works Busby wrote on wine, but this American edition is almost unknown; Hordern House have only handled one other copy, while the only copy of the book recorded in an Australian collection, in the National Library, was acquired some time after Ferguson completed his monumental biography and indeed apparently after the publication of the Addenda, as it is not listed in either work (but has since been given the Ferguson no. 1894d).Scotsman James Busby (1801-1871) was probably the most important single figure in the early history of the Australian wine industry. Busby's three books on viticulture had an enormous effect on the early wine industry. He had published Treatise on the Culture of the Vine in 1825; it was largely a compilation from European writers, addressed to 'the attention of the higher classes', but it prompted Governor Brisbane to encourage him in practical experimentation. A second work, his 1830 Manual of Plain Directions, was for decades the only really helpful book on the actual method of making wine, and copies of it are commensurably rarer than the preceding book, in our experience, no doubt because it was so much used and consulted.His third book described Busby's four-month tour of Europe, during which he collected four hundred and thirty-seven cuttings from Montpellier Botanical Gardens and one hundred and thirty-three from the Luxembourg Gardens. By January 1833 the vines - which Busby donated to the government - had arrived by convict ship the Camden and were flourishing in the Sydney Botanic Gardens. But when he came back to Sydney from New Zealand in 1840 he could find no trace of his collection. Duplicates had been planted in Busby's vineyard at Kirkton in the Hunter Valley and these were the basis of chardonnay in Australia. Kirkton was taken over by Lindemans in 1914, and is the country's oldest continually producing vineyard.Although Busby's books are now keenly pursued because of their significance to the Australian wine trade, it is important to remember that all three of his books had international interest precisely because of their detailed and practical nature, which set out the basics of wine-making in an accessible fashion. This is particularly true of this, the last of the three, which attempted to draw out rules and practices that could have international application. It was immediately hailed as an important book in Europe, with second and third editions being published in London in 1834 and 1839, but as the present book underscores, it was also quickly taken up in the United States. Very little work has been done on Busby's influence in Europe, let alone in America, but it would be fair to say he had a significant international impact, and did a great deal towards spreading the vigneron gospel to what might be called in this context the New World, away from the traditional heartland of France and Spain. The book has heavy foxing, particularly to title-page and preliminaries, the edges of the paper with some brittleness (the condition of the paper is not unusual for an American-printed book of this date), bound in modern brown library buckram. AUGSBURG. - Füssen. - Karte. "Chaussee von Augsburg ueber Donauwoerth nach Nürnberg". - 3 altkol. Kupferstiche aus Riedl, 1835, je 22 x 14,5 cm. Aus der sehr seltenen Fortsetzung des Adrian von Riedlschen Reise-Atlas von 1835. - Die drei Straßenkarten zeigen u.a. Mertingen, Donauwörth, Monheim, Treuchtlingen, Weissenburg, Ellingen, Roth, Schwabach und Nürnberg. Die dritte Karte zeigt in 2 Segmenten die "Chaussee von Augsburg nach Dillingen". - Mit breitem Rand und in sehr guter Erhaltung. A collection of 8 original engravings and lithographs, all showing Arabian horses. All signed in plate or stone. Don Quixote und sein Schildknappe Sancho Pansa halten ihre Siesta im Gebirge Morena. - Lithographie ( a. a. China ) v. u. nach Johann Geyer b. Kohler u. Comp. in München, um 1835, 29,7 x 38 - Blattgr. 44 x 61,8 cm Der Schildknappe liegt auf seinem Esel und trinkt, der Ritter in Rüstung sitzt und guckt in die Gegend. - Mit dem Blindstempel von Kohler in der Mitte unten und dem roten Sammlungsstempel der Königl. Hannoverschen Sammlung (Schloss Marienburg). links. - Sauber und sehr gut erhalten. Zum Künstler: Th.- B. XIII, 508 m. bes. Erwähnung dieses Blattes. Bildnis Friedrich Preller d.J. (1838-1901), Brustbild in Dreiviertelprofil nach links mit gesenktem Kopf. - Bleistift, auf festem chamoisfarbenem Velin, rechts unten bezeichnet und datiert &#132;Spinnmühle 92.". 22,8:14,7 cm. In den Rändern etwas vergilbt. Skizzenbuchblatt. Die Porträt- und Genremalerin war die Ehefrau des in Rom geborenen polnischstämmigen Genre- und Historienmalers Z. von Suchodolski (1835-1908). Sie war Schülerin von F.W.P. Pauwel (1830-1903) in Weimar, wo sie wohl nach 1862 ihren späteren Ehemann kennengelernt hatte, der ebenfalls Schüler von Pauwels war. Nach der Vita ihres Ehemannes, der 1863-1874 in Italien lebte und auch von ihr Bilder mit italienischen Motiven bekannt sind, ist ein gemeinsamer Aufenthalt in Italien anzunehmen. Ob sie ihm 1874 nach Weimar folgte, wo er Professor an der Kunstschule wurde, und dann 1880 nach München, ist zu vermuten. Zudem sind (längere) Aufenthalte um 1883 und 1892 in Dresden bekannt. Hier wird das Paar dem Freundeskreis um den Landschafts- und Marinemaler F. Preller d. J. (1838-1901) zugerechnet, der ab 1880 an der Dresdener Kunstakademie lehrte. Seit 1875 beteiligte sich die Künstlerin an Ausstellungen in Dresden, seit 1878 in Berlin, seit 1880 im Sächsischen Kunstverein und seit 1888 in München. Das Stadtmuseum Dresden besitzt von der Künstlerin ein Bildnis des Malers A.L. Richter (1803-1884). Eine nähere Verbindung läßt auch ein Brief Suchodolskas an Richter von 1881 vermuten. Sicile et Malte, sites, monumens, scènes et costumes. Recueillis et publiés par Audot Père. (L'Italie, la Sicile, les iles Eoliennes, l'ile d'Elbe, La Sardaigne, Malte, l?île de Calypso, etc. Tome 3 seul). Paris, Audot, Libraire-éditeur, 1835, - gr. in-8vo, 2 ff. (titre - liste des planches, Errata) + p. 271 à 370 (= 100 p. de texte à deux colonnes) + 29 planches gravées sur acier h.-t. avec 40 vues, reliure en d.-veau blonde, dos à cinq nerfs avec 2 pièces en maroquin rouge pour titre et tomaison. Coiffe sup. tirée. Première édition, 1 volume sur 3. D?après les inspirations, les recherches et travaux de M.M. le vicomte Chateaubriand, Raoul-Rochette Lamartine, le comte de Forbin, Piranesi, Mazzara et de Napoleon, Denon, Saint-Non, Lord Byron, Goethe, Visconti, Cicognara, Lanzi, de Bonstetten, Swinburne, etcPlease notify before visiting to see a book. Prices are excl. VAT/TVA (only Switzerland) & postage. Bellani 524. Die Euthanasie oder die Kunst den Tod zu erleichtern . London: Whittaker and Co., Ave-Maria Lane,. 1835. nineteenth-century three-quarter black leather and marbled boards, black leather spine labels, spine panels stamped in gold, all edges sprinkled red.. Ownership signature dated 1860 on the front paste-downs of both. volumes. Minor rubbing to boards and leather, a very good set. externally, nearly fine internally. (#148266). First edition. Howitt's first work of fiction. "Collection of seven novellas and short stories using material from the Old Testament to tell stories in a highly elevated, somber tone. The epic struggles in some cases involve angels and demons. A cosmic struggle in outer space unfolds in 'Nichar, the Exile of Heaven.' The author defends the use of exotic settings in his eight-page preface. It seems appropriate that this collection of tales of war and conflict should have belonged, as the ownership inscription attests, to a member of the British Army (9th Lancers)." - Robert Eldridge. Locke, A Spectrum of Fantasy Volume Two, . 63. Locke, Voyages in Space (2011) V381. Block, The English Novel 1740- 1850, p. 115. Not in Wolff, who had several other works by Howitt. TA., Hauptstrasse, im Hintergrund die Kirche Igreja de Candelaria, "La Grande Rue a Rio Janeiro". - Aquatinta ( a.a. China ) v. Himely n. Lauvergne aus Laplace, Voyage autour du monde b. Sainson, 1835, 22 x 31,5 Seltene Ansicht, deren Vorlage in den Jahren 1830 - 1832 entstand. Ein Ergebnis der Reise des franz Kapitains Cyrille Pierre Theodore Laplace mit dem Schiff "La Favourite". ( Vergleiche Sabin 38985: Borba de Moraes, 457. ). Chronik der Stadt Weißenburg im Nordgau und des Klosters Wülzburg. An Illustration of Osbourne's Pictorial Alphabet. C. Osbourne, and Messrs. Ackerman & Co., London 1835 - 28 engraved cards, 72x76mm, plus an 8 pp. stitched booklet printed on pink glossy paper, housed in a green mottled paper-covered card slipcase. The outer leaves of the booklet detached, plates lightly foxed and a bit soiled, edges slightly rubbed, slipcase cracked along one edge. The pictorial alphabet and its accompanying booklet of 'illustrations' is dedicated by permission to the future Queen Victoria (then Princess Alexandrina Victoria) by Charles Osbourne, who appears to have been singularly unsuccessful at a number of professions. A few years after this publication he was in debtor's prison in Warwick, described as being formerly 'General Dealer and Manager of the Magna Charta Steam Packet' in Hull, 'General Merchant' in Liverpool, 'Vendor of the Pictorial Alphabet' elsewhere in Liverpool, 'General Dealer' while lodging at multiple addresses in Middlesex, and most recently a lodger in Leamington, 'out of business'. The engravings are by Henry Wallis (c.1805-1890), also an unlucky man: brother to Robert and William Wallis, both also engravers (Robert particularly associated with Turner), he suffered attacks of paralysis and had to give up engraving, becoming a picture dealer instead. In the way of such small and loose children's material, copies are now quite rare, with COPAC locating holdings in the V&A and BL only. The Osborne Collection of Early Children's Books in Toronto holds 3 copies, none complete. 1835. first edition. More Rare, Valued Higher"With Three Plates Only Found Here (Tooley)[ALKEN, Henry, illustrator]. APPERLEY, C.J. Memoirs of the Life of the Late John Mytton, Esq., of Halston, Shropshire; Formerly M.P. for Shrewsbury, High Sheriff for the Counties of Salop & Merioneth, and Major in the North Shropshire Yeomanry Cavalry. With Notices of His Hunting, Shooting, Driving, Racing, and Extravagant Exploits By Nimrod. With Numerous Illustrations by Alken. Reprinted from the New Sporting Magazine. London: Rudolph Ackermann, 1835. First edition. Octavo (8 1/4 x 5 1/4 in; 210 x 134 mm). iv, [2, Preface], 110 pp. Twelve hand-colored aquatint plates (including frontispiece) all with tissue guards.Publisher's original blind stamped pebble-grain brown cloth with title in gilt within ornamental gilt frame. Front endpaper expertly re-inserted. With the bookplate of Joel Spitz on front paste-down. A wonderful copy. Housed in a later full dark brown morocco pull-off case by The Lakeside Press, Chicago. A somewhat rare book in the original cloth.Provenance: Joseph Widener (1871-1943), American art collector, founding benefactor of the National Gallery of Art in Washington, D.C. and thoroughbred horse enthusiast with his small oval leather bookplate on front paste-down; Acquired at his sale 28 November 1944. "Though containing only 12 plates, this first edition is more rare, and valued higher than the second edition which contains 18 plates. 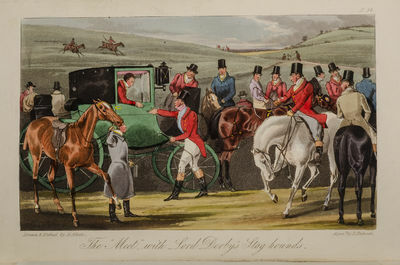 Three plates of this first edition, namely 2 [Mytton shooting in Winter], 8 [Blood on the Bull Dog], and 9 [Mytton masters the savage dog], did not appear in the second edition. A most valuable and important book for the sporting life of the period, aptly described by Newton as 'a biography of a man that reads like a work of fiction'" (Tooley). "This is not a work of fiction, for John Mytton, a rather inglorious character for a biography, was a hard-living, hard-drinking country squire of Halston, Shropshire, capable of the utmost physical endurance, and ready to accept any wager to walk, shoot or ride against any man. Many of his feats are recorded and graphically delineated, including the climax of his folly in setting his nightshirt on fire to cure a hiccough (Martin Hardie).Tooley 66. Schwerdt I, p. 38. Podeschi 147. Encyclopädie der gesammten musikalischen Wissenschaften, oder Universal-Lexicon der Tonkunst. Bearbeitet von M. Fink, de la Motte Fouqué, Dr. Grosheim, Dr. Heinroth, Prof. Dr. Marx, Director Naue, G. Nauenburg, L. Rellstab, Ritter v. Seyfried, Prof. Weber, Baron v. Winzingerode, m. A. und dem Redacteur Dr. Gustav Schilling. In Band 1 mit einem Stammbaum der Familie Bach und drei Notenbeilagen. 6 Bände mit Supplementband (= 7 Bände). MÜNCHEN. - Lotterie. "Münchner Volksleben. Die Zahlenlotterie" in München. "Eine lebhaft bewegte (Lotto-)Spielergruppe, reich an originellen, charakteristischen Typen, betrachtet die neu gezogenen Nummern, die soeben ausgehängt werden" (Lentner) mit teils freudiger, teils enttäuschter Miene. - Lithographie von Fr. Kaiser bei J.B. Kuhn, um 1835, 28 x 36 cm. Pfister II, 2947; Slg Proebst 1813; Lentner 12373 und 14002:"Selten!". - Nur im Rand etwas fleckig und mit hinterlegten Einrissen. Titel knapp beschnitten. "Münchner Volksleben. Die Zahlenlotterie" in München. "Eine lebhaft bewegte (Lotto-)Spielergruppe, reich an originellen, charakteristischen Typen, betrachtet die neu gezogenen Nummern, die soeben ausgehängt werden" (Lentner) mit teils freudiger, teils enttäuschter Miene.
. Lithographie von Fr. Kaiser bei J.B. Kuhn, um 1835, 28 x 36 cm.. Pfister II, 2947; Slg Proebst 1813; Lentner 12373 und 14002:"Selten!". - Nur im Rand etwas fleckig und mit hinterlegten Einrissen. Titel knapp beschnitten. Paris: Bachelier, 1835. Fine. Bachelier, Paris 1835, 13x20,5cm, relié. - First Edition. Binding half sheepskin caramel, flat spine decorated with gilt fillets and strips with small traces of friction, an upper corner slightly blunt, contemporary binding. Work well complete its 4-folding plates in fine. Some small foxing, tiny gaps without gravity at the top of the first guard. Rare. --- Please note that the translation in english is done automatically, we apologize if the formulas are inaccurate. Contact us for any information! - [FRENCH VERSION FOLLOWS] Edition originale. Reliure en demi basane caramel, dos lisse orné de filets et de frises dorés comportant de petites traces de frottements, un coin supérieur légèrement émoussé, reliure de l'époque. Ouvrage bien complet de ses 4 planches dépliantes in-fine. Quelques petites rousseurs, infimes manques sans gravité en haut de la première garde. Rare. Paris: Eugène Renduel, 1835. Fine. Eugène Renduel, Paris 1835, 14x21,5cm, relié. - New edition for The King has fun, first edition with a false mention of fourth to Lucrezia Borgia. Blond half calf binding, back with four nerves decorated with nets gilded dots and nets cold frieze golden Length Greek, contreplats and guards made paper, contemporary binding. The king is full of fun engraved frontispiece of Camille Rogier while Lucrezia Borgia is complete the engraved frontispiece of Célestin Nanteuil on China pasted. Foxing and wetting angle. Provenance: Library of Madame Mareuil who created the character of Casilda in Ruy Blas. - [FRENCH VERSION FOLLOWS] Edition originale. Reliure en demi veau blond, dos à quatre nerfs orné de filets, pointillés dorés et de filets à froid frise à la grecque dorée en pied, contreplats et gardes de papier à la cuve, reliure de l'époque. Le feuillet de nomenclature des oeuvres de Victor Hugo est bien présent. Rousseurs. Provenance: de la bibliothèque de Madame Mareuil qui créa le personnage de Casilda dans Ruy Blas. Die Wundermappe. 1. Bd., 2. Abt., 1. Lieferung. Oberitalien ( Venedig ). Louis XVII. lebt!! : Memoiren Carl Louis, Herzog's der Normandie, legitimen Königs von Frankreich. Von seinem Eintritt in den Tempel 1792, bis auf die neueste Zeit. Mit einer Vorrede des Prinzen, authentischen Briefen und historischen Erläuterungen. Nach dem in London als Manuscript gedruckten Originale. 1835. Signed. MCCOY, Isaac.The Annual Register of Indian Affairs within the Indian (or Western) Territory. No. 1. Published by Isaac McCoy. Shawanoe Baptist Mission House, Ind. Ter. January 1, 1835. [Kansas Territory]: Shawanoe Mission, J. Meeker, Printer, 1835.First edition, association copy of the first work printed in English in the Kansas territory, Isaac McCoy? 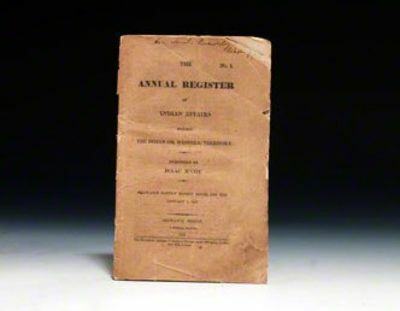 's self-published 1835 Annual Register of Indian Affairs championing Indian rights, from the library of Jacksonian Congressman Samuel Beardsley, inscribed on the front wrapper, ?"Hon. Saml. Beardsley, Washi—D.C.?" (inscription partially trimmed), with prospectus printed on wrappers.Isaac McCoy was appointed a Baptist missionary to Indians and Illinois in 1817 and there formed ? "the idea of a permanent Indian country, west of Missouri.?" An 1824 trip to Washington, D.C. to present his plan to Secretary of War Calhoun, ? "marked the shift in his career from a missionary to a political lobbyist… McCoy favored a policy of negotiation that respected the tribes?' right to ratify or to reject removal treaties, but he came to be convinced that removing the Indians from the lands east of the Mississippi was the only way to save them. McCoy? 's proposal of an Indian state called for the consolidation of all the Indians in the West and the dissolution of the tribal organization… In 1828 he was also appointed to a commission to manage the removal of the Ottawa and the Miami to the West… [and] came to support Andrew Jackson? 's removal policy, although he criticized its emphasis on removal rather than colonization… In May 1830, McCoy was commissioned to survey the boundaries of the domains assigned to the various Indian tribes?" (ANB). In1833, McCoy? 's son Jotham brought a printing press to his father? 's Kansas mission and ? "in January 1835 McCoy issued from this press the first of four numbers of The Annual Register of Indian Affairs.?" McCoy later traveled to Washington ? "several times to plead the Indians?' cause, reporting directly to government agencies?" (Wagner-Camp 81). This rare first edition of his first publication on Indian Affairs was published to argue for the better treatment of Indians by presenting ? "correct historical sketches of the past, and information respecting their present condition,?" in hopes ? "that it is not too late to rescue from ruin, the scattered remnants of this noble race of men.? "Sabin 43110; Graff 2586-8; Wagner-Camp 38, 46a, 81.Text generally fresh with light foxing, faint margin dampstaining, bit of loss to upper right corner of front wrapper, tape repairs to wrapper. An extremely good association copy of this rare work. Boston: Benjamin B. Mussey. 1835. Second Edition. Hardcover. 116pp. Contemporary full calf, spine rebacked with black label lettered in gold. Name in ink and pencil on the front free endpaper, some markings to front pastedown endpaper, scattered foxing throughout. A good+ copy. ; Quarto . Dublin: William Curry, 1835. First edition.. Hardcover. 8vo. (7 x 4.25 inches). pp.352. Engraved plates and fold-out map. 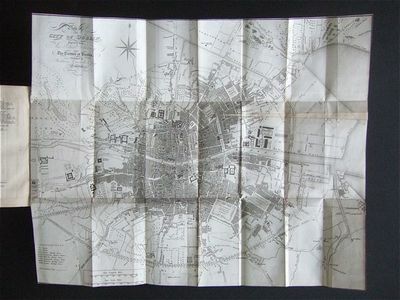 Frontis, vignette to half title page, all plates as called for, fold-out map with old repair. Some light occasional spotting to some plates. 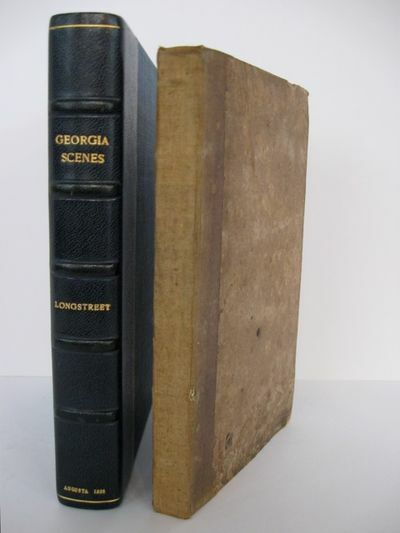 Original publisher's green small-pebbled roan (sheepskin), red label gilt to spine, spine faded. Coated endpapers. Names in ink and pencil to front pastedown, with name in ink to front free endpaper. An old repair to a sliver of the map, re-inforced with cotton tape (so it appears). O/w contents clean and bright. Binding firm and square. A Very Good copy indeed. We reduce the default shipping charge for lighter books or use it for a tracked service if books are expensive or uncommon. We pack books securely in boxes, or corrugated card or cardboard, and protect corners with bubble-wrap. Felsenschlucht, das Mühlental bei Sorrent.
. Pinsel in Braun, über Bleistiftskizze, auf cremefarbenem Velin, verso am Oberrand mit grauer Feder bezeichnet "Diese Skizze von meinem Vater E F Pape Sorent 1835 (sic!, muß lauten: 1845) Friedrich Pape". 28,7:22,7 cm.. Pape studierte von 1834-1839 an der Berliner Akademie Landschaftsmalerei bei C. Blechen (1798-1840) und W. Schirmer (1802-1866). Seinen Lebensunterhalt verdiente er im Atelier des Theater- und Dekorationsmalers J.K.J. Gerst (1792-1854), der ihn gleichzeitig zum Deckorationsmaler ausbildete. 1845 machte Pape eine Studienreise nach Tirol., der Schweiz und Italien. 1839-1853 beteiligte er sich an der Ausmalung des Neuen Museums in Berlin, hauptsächlich mit Rekonstruktionen antiker Architekturen nach Vorgaben F.A. Stülers (1800-1865) im Griechischen und Römischen Saal. 1853 erhielt der Künstler eine Professur an der Berliner Akademie und wurde auch deren Mitglied. Wie sein Lehrer Blechen es oft tat, wählte auch Pape hier die braune Sepiatinte als Zeichenmittel. Darüber hinaus kann man vermuten, daß der Schüler in Italien auf den Spuren seines Lehrers wandelte und vermutlich handelt es sich, anders als vom Sohn angenommen, der sich auch bezüglich des Jahres geirrt hat, bei der Zeichnung um ein Motiv aus dem Mühlental bei Amalfi, das Blechen im Frühsommer 1829 mehrfach zeichnete. Bei der kleinen Spitze, die hinter einer Felswand hervorschaut, handelt es sich um das Ende eines Schornsteins einer Mühle. 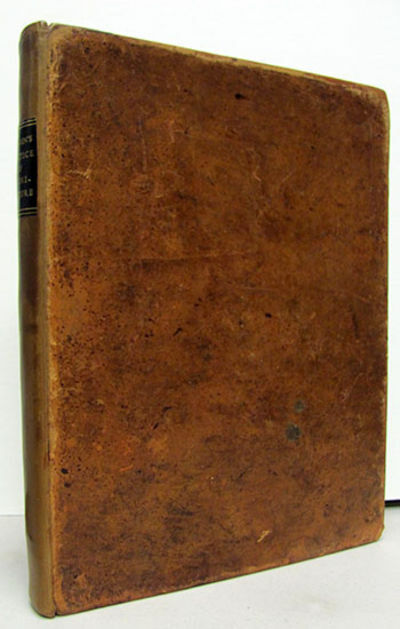 Philadelphia: Published by Mitchell & Hinman, 1835.. 84,pp. plus large folding colored map, 19 x 23 3/8 inches. In original gilt straight-grain morocco covers. Some expert repairs to spine ends. Some foxing on text leaves. Map with a few minor clean splits at folds, easily repairable. Binding clean and very good. The handsome map is MITCHELL'S MAP OF THE UNITED STATES; SHOWING THE PRINCIPAL TRAVELLING, TURNPIKE AND COMMON ROADS; ON WHICH ARE GIVEN THE DISTANCES IN MILES FROM ONE PLACE TO ANOTHER.... 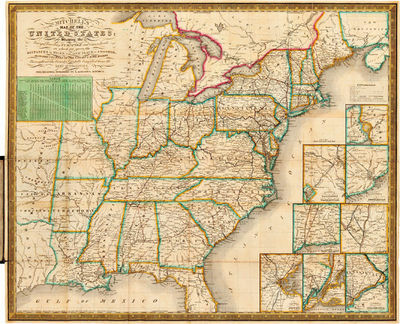 The map includes insets of eight cities and regions (New Haven, Baltimore and Washington, New York, Boston, Charleston, etc.). The map extends westerly only to the Brazos River in Texas (still called Mexico) and Missouri Territory (noting Indian regions for Kickapoos, Shawnees, Osages, Cherokees, Creeks, Choctaws, etc.). A very nice pocket map and traveller's guide by this prolific publisher of cartographic material. HOWES M686. à Paris: Chez Desenne, 1835. Fine. Chez Desenne, à Paris 1835 - 1837, 2 tomes en 2 Vol. in 4 (21,5x27,5cm), relié. - Edition of two series published in 1835 and 1836 respectively. 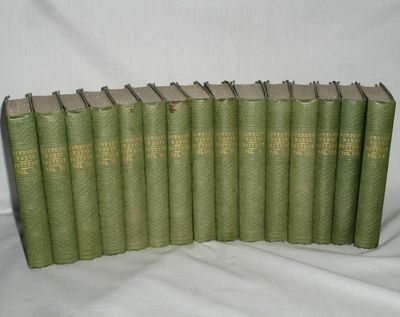 36 steel engravings power the first volume and the second 40 or 76 prints engraved by various English writers and imrpimées on strong paper under curve. A large vignette title and frontispiece in the second volume, both dated 1836, they could not be part of the first. Half green morocco signed Boutigny. 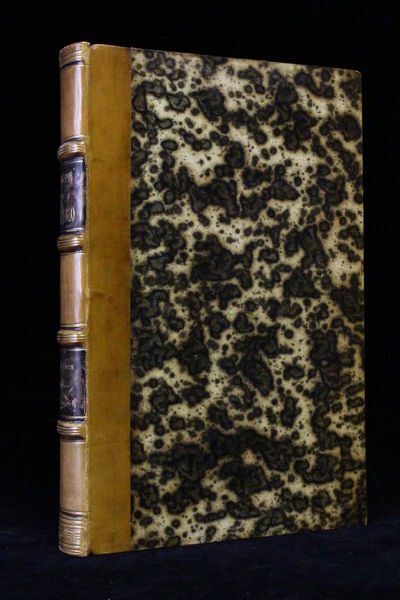 The second volume, although using the same irons (and the same paper sheet), and out of the same workshop is in a significantly different binding (connected two years later), half marine shagreen, the whole being finally more aesthetic than if the color was similar. Iron romantic long gilt. 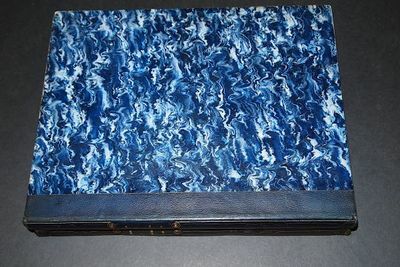 Beautiful blue marbled paper. Despite a few tiny foxing to the place of serpentes and margins, very fine copy. The choice of works gives pride to major sites in Europe, there is even the Mont Saint-Michel, and universal representations, like Don Quixote. Each work is accompanied by a blurb. --- Please note that the translation in english is done automatically, we apologize if the formulas are inaccurate. Contact us for any information! - [FRENCH VERSION FOLLOWS] Edition originale des deux séries parues respectivement en 1835 et 1836. 36 gravures sur acier pou le premier volume et 40 pour le second, soit 76 gravures gravés par divers graveurs anglais et imrpimées sur papier fort, sous serpentes. Une grande vignette de titre et un frontispice dans le second volume, toutes deux datées 1836, elles ne pouvaient donc faire partie du premier. Demi maroquin vert signé Boutigny. Le second volume, bien qu'utilisant les mêmes fers (et le même papier de garde), et sortant du même atelier se trouve dans une reliure sensiblement différente (relié deux ans plus tard), en demi chagrin marine, l'ensemble étant finalement plus esthétique que si la couleur était semblable. Fer en long romantique, titre doré. Très beau papier marbré bleu. Malgré quelques infimes rousseurs à l'endroit des serpentes et dans les marges, très bel exemplaire.Le choix des oeuvres fait la part belle aux grands sites d'Europe, on y trouve même le Mont Saint-Michel, et à des représentations universelles, tel Don Quichotte. Chaque oeuvre est accompagnée d'un texte de présentation. London; 1835-1837: Baldwin and Cradock. 12mo - over 6¾" - 7¾" tall. In 15 volumes. frontspieces, engraved title and regular title pages, plates and ports. v. 1-3 Life and works of Cowper, by R. Southey --v.3-7. Letters -- v 8. Miscellaneous, poems. Olney hymms. Anit-Thelyphthora. Table talk and other poems. Translations from Vincet Bourne -- v. 9 Translations from Madame de La Mothe-Guion. The task. Tirocinium. John Gilpin and other poems -- v. 10 Posthumous poems. Translations from Vicent Bourne. Translations of the Latin and Italian poems of Milton. Epigrams tr. from the Latin of Owen. Translations of Greek verses. Translations from the Fables of Gay. Adam: a scared drama, tr. from the Italian of Andreini -- v. 11-12. Translation of Home's Iliad -- v. 13-14 Translation of Homer's Odyssey -- v. 15. Letters. Papers in the Connoisseur. Fragments of a commentary on Paradise lost. Wm. Cowper 1731-1800. Vol 7 has small dark stain at top of spine. A fine, handsome set bound in original green cloth decorated in blind, spines gilt. JOHNSON, Samuel) BOSWELL, James (POZZI, HAWKINS, STEEVENS, etc.). The Life of Samuel Johnson. Including a Journal of his Tour to the Hebrides. To which are added, Anecdotes by Hawkins, Piozzi, Murphy, Reynolds, Steevens, etc., and Notes by various hands. And Johnsoniana. London: John Murray,, 1835. Including a journal of his tour to the Hebrides; to which are added, Johnsoniana; or, anecdotes by Hawkins, Piozzi, Murphy, Tyers, Reynolds, Steevens, &c. and notes by various hands. 10 volumes, small octavo (160 x 100 mm). Contemporary tan full calf, twin dark green morocco labels, spines richly gilt, boards ruled in gilt and blind, all edges gilt, inner dentelles in blind, marbled endpapers. Engraved frontispieces, additional illustrated titles, double-page plate and two folding plates including map. Light spotting to plates. A bright set in excellent condition. 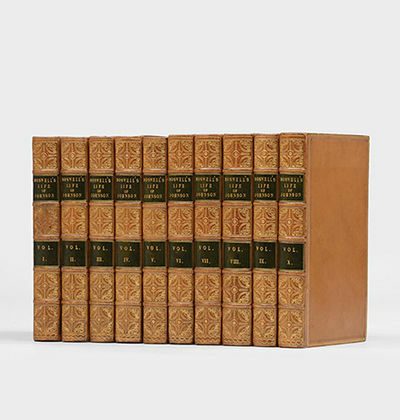 An appealingly bound set of the Life of Johnson, which was originally published in 1791. Paris: Hippolyte Souverain, 1835. Fine. Hippolyte Souverain, Paris 1835, 13x21,5cm, relié. - Edition illustrated in frontispiece of an etching on China Edward May. Binding half embossed chocolate sheepskin, back smoothes decorated with double gilded nets, golden tail frieze, marbled paper plates, guards and contreplats blue paper sky, contemporary binding. Noble stamp printed by way of bookplates on a guard, light spots, a tiny marginal tear without missing on the title page. - [FRENCH VERSION FOLLOWS] Edition originale illustrée, en frontispice, d'une eau-forte sur Chine d'Edouard May. Reliure en demi basane gaufrée chocolat, dos lisse orné de doubles filets dorés, frise dorée en queue, plats de papier marbré, gardes et contreplats de papier bleu ciel, reliure de l'époque. Tampon nobiliaire imprimé en guise d'ex-libris sur une garde, légères rousseurs, un minuscule accroc marginal sans manque sur la page de titre. Narrative of a second voyage in search of a north-west passage, and of a residence in the Arctic regions during the years 1829, 1830, 1831, 1832, 1833. Including the reports of Commander, now Captain James Clark Ross, and the discovery of the northern magnetic pole. London, England: John Murray, 1835. "...to Which are Added, Anecdotes by Hawkins, Piozzi, Murphy, Tyers, Reynolds, Steevens, &c. and Notes by various Hands." 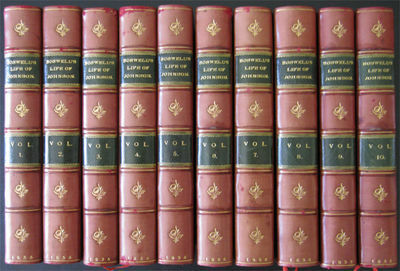 Complete in ten volumes, 1835. Printed by A. Spottiswoode, London. Later half-leather bindings, by Root & Son, (binder's stamp to front free-endpapers), in claret polished calf, with crisp blind-stamped rules to the boards and with crisp gilt-stamped design to the hubbed spines, each spine with two green morocco labels with crisp gilt-stamped lettering. Handsome marbled paper hardboards. Generally unbumped spine heads and tails. Fairly sharp corners with a touch of rubbing. Almost no observable scuffing to the boards or leather and on the whole very clean and presentable bindings. Hinges strong. Text blocks firmly bound in. 6.5 x 4.25 inches. T.E.G. With handsome marbled paper pastedowns and FEPs. Text pages with copious footnotes and Vol. X with index. 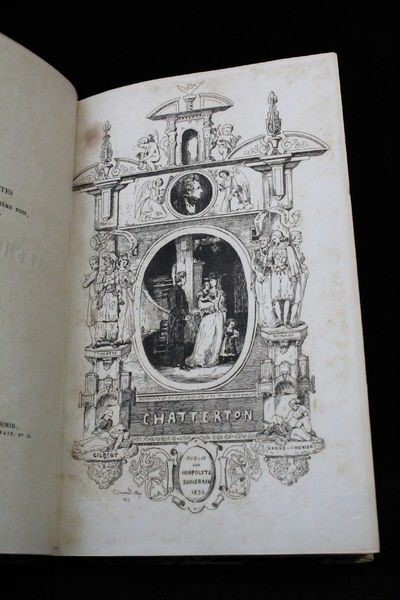 Each volume with lithograph frontispiece and half title page vignette: for example, Vol. I with frontispiece portrait of Samuel Johnson and with vignette depicting the house in which Johnson was born. Fold-out facsimile letter between pp. 208-209 of Vol. VI. Red ribbon page markers. As to all volumes, preliminaries foxed. To a rear FEP in each volume, tiny sticker of previous bookseller. Else very clean. Very Good Plus copies. Scarce in any condition. An exceptionally handsome set of bindings, and a pleasure to hold in hand.. First Edition Thus. Half-Leather. Very Good Plus. 16mo - over 5¾" - 6¾" tall. MÜNCHEN. - Fasching 1835. "Quadrilles parées, costumées executées à la cour de Sa Majesté le Roi de Bavière le 3 fevrier 1835 représentant . les principaux personnages de Quentin Durward" etc. Sechs Darstellungen auf sechs Blättern. Namentlich bekannte Persönlichkeiten des diplomatischen Corps, des Hofes und des bayerischen Adels haben sich nach den Charakteren des Romans von W. Scott verkleidet für den Faschingsball bei König Ludwig I. am 3.2. 1835. - 6 altkolorierte Lithographien von J. Kürzinger nach J.Ch. Fries bzw. F.X. Nachtmann bei Hermann, München, 1835, je ca. 24 x 19 cm. Lentner 2656: "aufs feinste colorierte Tafeln"; Thieme-Becker Bd. XII, S. 484: J.G.C. Fries, Kostümier am Hoftheater: "J. Kürzinger hat Szenen von einem Hofball 1835, dessen Kostüme F(ries) entworfen hatte, auf Stein gezeichnet." - Vorhanden: 1. "La Comtesse Isabelle de Croye. Quentin Durward", dargestellt von Amalie Freiin v. Krüdener (1808-1888, Gemahlin des Alexander Freiherr v. Krüdener, Russischer Geschäftsträger in München), und Monsieur de Reinhard. 2. "Dames de la suite de la Princesse Jeanne", dargestellt von Gräfin Leopoldine d'Arco, verwittwete Kurfürstin v. Bayern (1776-1848, als Comtesse de Guines), Gräfin von Bassenheim (als Comtesse de Joigny) und Baronin von Gumppenberg-Pöttmes (als Marquise de Monserrat). 3. "Garde écossaise", dargestellt von Graf Arco Zinneberg und Monsieur Erskine (David Montagu, 1776-1855, britischer Gesandter in München. 4. "Philippe de Commines. Charles le téméraire", dargestellt von Prinz Ivan de Gagarin (1814-1882, russischer Botschaftsattaché in München, seit 1843 Jesuit) und Graf von Koutousoff. 5. "Le Sire d'Hymbercourt. Tiel Wetzweiler", dargestellt von Baron Charles de Buseck und Baron F. de Buseck. 6. "Héraut d'armes", dargestellt von Monsieur Barton. - Leuchtendes Altkolorit! Sitzendes junges Mädchen, Dreiviertelfigur en face. - Bleistift, um 1835, auf cremefarbenem Papier mit Fragment des Wasserzeichens: J Whatman 18?? 26,2 x 18,7 cm. Provenienz: L&#146; Art Ancien S.A., Zürich, 1981, Katalog 71, Nr. 38. Vergleichsliteratur: Die Zeichnungen und Aquarelle des 19. Jahrhunderts in der Graphischen Sammlung der Staatsgalerie Stuttgart. Bestandskatalog. Bearb. von Ulrike Gauss. Stuttgart 1976, Nr. 245 mit Abb. Dargestellt ist auf unserer Zeichnung - ebenso wie auf der in Stuttgart - vermutlich eine der Schwestern des Künstlers, bei denen Fellner in Stuttgart lebte. Bereits während seines Jurastudiums 1817-1824 in Heidelberg und Göttingen hat sich der 1825 in seiner Heimatstadt nur für kurze Zeit als Advokat tätige Fellner autodidaktisch zum Maler ausgebildet. Im Oktober 1825 ging er zum Kunststudium nach München, wo ihn vornehmlich Peter von Cornelius (1783-1867) anregte. Freundschaftliche Kontakte pflegte er mit Moritz von Schwind (1804-1871) und den Dichtern Ludwig Auerbach (1840-1882) und Justus Kerner (1786-1862). 1831 ließ er sich in Stuttgart nieder, wo er bis zu seinem Tode lebte. Fellner zeichnete sich besonders auf den Themengebieten der Geschichte, Sage und Dichtung aus, die er mit unerschöpflicher Phantasie zeichnerisch variantenreich verarbeitete, wobei er bewußt Stilmerkmale der altdeutschen Kunst verwendete. Ein Teil seines zeichnerischen Nachlasses befindet sich heute im Städel Museum, Frankfurt am Main, auch das Goethe-Museum in Düsseldorf besitzt Arbeiten des Künstlers.